Just a tad of sweetness from maple syrup and crunch from sesame seeds for this addictive healthy snack. What type of kale to use? I've had great luck with both the regular curly type of kale as well as the Italian or lacinato kale (also sometimes referred to as dinosaur kale). Tear the kale into pieces a bit larger than bite-sized, since the kale shrinks considerably. 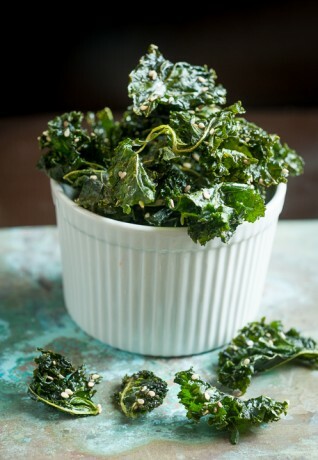 Preheat the oven to 300° F. Place the kale in a large bowl and drizzle with the olive oil and 2 pinches of salt. Massage the kale with your hands until all areas of the kale leaves are covered and softened a bit. Mix in the maple syrup, cayenne and sesame seeds. Most of the sesame seeds should stick to the leaves. Place on a parchment-lined baking sheet. Bake 25 to 28 minutes, mixing several times to prevent outer edges from burning and to keep kale pieces as separate as possible. Taste a piece while cooking and add an additional pinch of salt if needed. Let cool on the baking sheet; the mix should crisp up nicely. Variation: Add a sheet of nori seaweed to the mix, tearing up and roasting in the last few minutes of the baking process. Salad spinners: make a great tool for rinsing and drying the kale. It gets the kale leaves as dry as possible which helps in the crisping process.